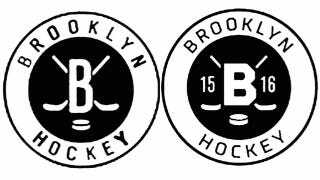 Nets Daily (via Sporting News) has discovered the above two logos, filed on Feb. 12 and Feb. 17 with the U.S. Patent and Trademark Office, by Brooklyn Arena LLC—the company that runs the Barclays Center, where the Islanders will begin play next season. But since it's the arena trademarking these logos, it's a very strong hint that black-and-white gear—matching the Nets' identity—will at the very least be for sale, and may not even wait for the Isles to reveal their alternate sweaters. "We have a platform at Barclays Center for each of our non-core tenant businesses, including BROOKLYN HOOPS for college basketball, BROOKLYN BOXING for boxing, BROOKLYN SHOW for concerts, and BROOKLYN FAMILY for family entertainment. BROOKLYN HOCKEY is our latest platform, which includes NCAA college hockey that will be staged at the venue. This is not an Islanders logo and has no connection to the Islanders. As promised, we are keeping the current Islanders logo and color scheme, while adding a black and white third jersey."